World Methodist Council and Intentional Growth Center and attracts visitors and guests from all around the world. Area residents flock to the wonderful walking trail for a little exercise and/or to simply enjoy the beauty. It is becoming a regular haunt for photographers. And the new boat landing has provided more access for fishermen. Walkers, runners, visitors, photographers and fishermen enjoy the lake year round. But for one group of users, it’s September through May that has their hearts a’flutter. From the beginning of fall migration till the end of spring migration birders keep a watchful eye on the lake, and for good reason. I need to track down a more current list of species recorded from Lake J – I would guess it’s starting to approach the 200 mark. I have a list compiled by Jonathan Mays, which I believe is only for 2004 – 2006 and it has 156 species. The list has at least 30 species of waterfowl including all three of the scoters – surf, black and white-winged plus common goldeneye, Ross’s goose and cackling goose. Common loons along with white and brown pelicans have been reported from the lake as well as great blue heron, green heron, little blue heron, black-crowned night heron, great egret, snowy egret, cattle egret and sandhill crane. Other shorebirds include killdeer, spotted sandpiper, solitary sandpiper, greater yellowlegs, lesser yellowlegs, black-bellied plover, American golden plover, dunlin, willet, pectoral sandpiper, least sandpiper western sandpiper and more. A new gull was added this year – lesser black-backed – as a result of Hurricane Florence. Gulls already on the list include ring-billed, herring, Sabine’s, Bonaparte’s and laughing. It’s easy to understand the focus on waterfowl at Lake Junaluska – it is, after all, a lake. And places for watching waterfowl in the mountains are limited. But there is also a lot of passerine (song bird) activity in spring and fall. Some of the rarer for the area include white-eyed vireo, warbling vireo, Swainson’s thrush, American pipit, Nashville warbler, blackpoll warbler, bay-breasted warbler, pine warbler, Baltimore oriole and rusty blackbird. Everyone was thrilled last year when a pair of bald eagles decided to set up nest-keeping at the lake. Alas, they didn’t produce any (known) chicks but I have heard that eagles have been seen at the nest already this season so maybe they will try again. Ducks will be wherever you find them. 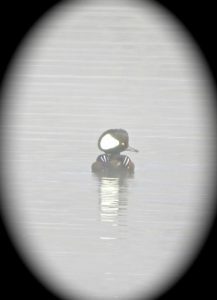 They could be along Highway 19 and/or near the wetlands area or they may be out from the swimming pool or near the dam. Large rafts are generally migrating and looking for a place to rest. They generally settle in for a few hours, or if they hit the lake in the afternoon they might linger till the next morning before they’re off again. Other ducks, mostly diving ducks like ring-billed, scaup and redhead, in small groups may stay for days or even weeks. And there are the ruddy ducks and American coots that seem to spend the entire winter on the lake. One of the best places to view migrating passerines is up near the cross where you can keep an eye on the spruces – that act like a magnet for Cape May warblers – and the large oaks around the lodge and lake edge. So if you plan on going for a walk around the lake between now and May you might want to keep a pair of binoculars handy.